West Florida Yachts would love to guide you through a personal showing of this 133' IAG Tri-Deck Motor Yacht 2016. This yacht for sale is located in Jupiter, Florida and priced at $15,098,000. For a showing please contact us by filling out the form on this page and we will get back to you shortly! Serenity was created by Evan K. Marshall Design (EKM) design for charter or private use. She is a spectacular Tri-Deck Motor Yacht, the latest in EKM design. The systems are top brand US purchased for good service. Her fit and finish are sure to impress the most discriminating yacht connoisseur. Major highlights include an interior 4-Level elevator, floor to ceiling windows, multiple balconies (Salon, Master, and Skylounge), light box flooring, backlit onyx, and multiple entertaining spaces and private areas for 12 guests. A spectacular waterfall jacuzzi on the Flybridge and wading pool with backlit skylights showing through the ceiling of the 01 deck are designs unique to Serenity. Garage/Beach with exclusive Z-Lift Sytem that creates a perfect underwater beach allowing easier egress from the water for divers or swimmers. It may double as a passerelle or be conveniently stored creating a regular swim platform. Enter the Main Salon via automatic sliding glass doors. Huge floor to ceiling windows are framed in gorgeous backlit onyx, which is featured on the cabinet tops throughout the vessel. Dark walnut soles, Anegre (African Maple) cabinetry and lacewood accents offer a natural base on which tasteful accents reside. A comfortable L-shaped sofa is located to port with a drop down television concealed in the ceiling. Opposite are iron stairs leading to the Skylounge. Forward is glass dining table with textured lighting above and formal seating for 12. From the Dining forward to port is the galley with forward access stairs to crew. From the Dining forward to starboard, an automatic sliding door separates access to Master and lower staterooms. A stone waterfall encased in glass on the wall and matching light box flooring create an intriguing ambiance. There is an access door for the elevator as well as a Day Head. Continuing forward is a study area, personal galley access for the Master, and the Master Stateroom. The Master Stateroom has one of a kind balconies to both port and starboard with automatic watertight sliding doors. The His and Her En Suite is engulfed in an calming jade colored onyx with hand-laid stone inlays. The next level up is the Pilothouse/Skylounge Deck. This is arguably the most inticing area of the vessel with endless entertainment possibilities. There are balconies on either side, with sliding door to port balcony. An intimate seating area with electric fireplace and starboard balcony which offers a forward view from an indoor vantage point. There is a card table for 4 and a bar for 6. Aft deck seating for 12 at a round table with a unique view through overhead oval skylights to a wading area above. Returning back inside and continuing forward to port, light box stone flooring leads the way to a dream-come-true VIP stateroom with ensuite. The hallway also leads to a Day Head, the elevator access, the Captain's Quarters, and finally, the Pilothouse. The Pilothouse features heavy duty port and starboard access doors, reverse shear windows, and a full raised bench seating area with table. There is a vast array of electronics. The Sundeck is also accessible by Elevator which is fascinating to witness, as the concealed elevator pops up from below deck. There is a hinged "hidden" helm station with convertible seating aft (tracks allow for configuration of seating to alternate from forward facing to aft facing, depending on preferences). The full hard top is equipped with a refreshing misting system. There's a 6 person Jacuzzi with waterfall and a 6" wading area aft with round, back-lit skylights built in to the deck. As with all levels, this deck offers a convenient Day Head. A full bar and Grill round out the area. GARAGE/BEACH - Exclusive Z-Lift System creates a perfect underwater beach allowing easier egress from the water for divers or swimmers. It may double as a passerelle or be conveniently stored creating a regular swim platform. Serenity is IAG’s 7th large yacht delivery in the last 6 years. 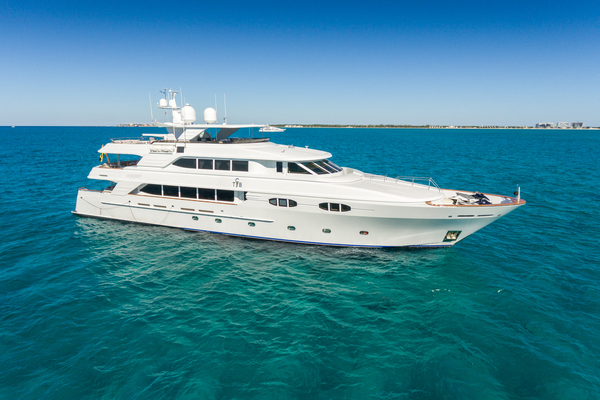 Following the highly successful 140’ King Baby delivery in 2016, this is the second Evan Marshall design creation from the same shipyard delivered less than one year later. With exciting revolutionary fixed balconies rarely seen in yachting, this makes Serenity a real head turner in every port she visits! Complete construction supervision by a build team of highly experienced American yacht captains and yacht engineering specialists over the past 3 years, delivered this exciting new IAG to the North American market. This 6 stateroom tri-deck design with a 4 level elevator ticks all of the boxes for any owner’s comfort requirements. The interior volume is equal to a 50 meter yacht and she feels spacious and bright with expanded glass windows everywhere, exceeding all expectations. Serenity is full of surprises. Wait until you see the extra features related to the swim platform with its beach transformation and very large cabana space! Owner change in plans makes this exceptional yacht available immediately without the normal 30 month delivery wait.